Perhaps the most significant and original insight of the Harvard cosmologist David Layzer is his explanation of the growth of order and information in a universe that began in equilibrium, but departs from equilibrium despite the second law of thermodynamics. As the universe expanded, both its rate of expansion and the rates of particle encounters decreased, but the latter decreased faster than the former. As a result, some kinds of equilibrium ceased to prevail, and the corresponding probability distributions ceased to be maximally random. For example, in the standard evolutionary scenario, which assumes that the cosmic microwave background is primordial, matter and radiation decoupled when their joint temperature fell low enough for hydrogen to recombine. Thereafter, the matter temperature and the radiation temperature declined at different rates. So while matter-radiation interactions tended to equalize the matter and radiation temperatures, generating entropy in the process, the cosmic expansion drove the two temperatures farther apart, generating information...competition between the cosmic expansion and nuclear reactions generated both entropy and information. Layzer says "I have argued that while local processes drive local conditions toward local thermodynamic equilibrium, the cosmic expansion and the contraction of self-gravitating astronomical systems drive local conditions away from local thermodynamic equilibrium, creating both information and entropy." He rarely tells us how long ago he first developed this idea, or that he is the sole author of this profound cosmological insight, which is a foundational concept for information philosophy. As a result, the idea has been mentioned many times in the literature without always citing Layzer as the original source. We attempt to correct this lack of proper attribution (even by Layzer himself), by citing the earliest references and several very important ones in recent years. In the 2010 article, Layzer cites his paper "Cosmogonic Processes" presented at the Brandeis Summer Institute of Theoretical Physics in 1968, published as Astrophysics and General Relativity, two volumes, edited by Max Chrétien, Stanley Deser, and Jack Goldstein, Gordon and Breach, NY, 1971. It appears to be Layzer's first publication of his growth of order theory. Layzer begins with a hypothesis of Ludwig Boltzmann that depends on the universe being infinite. Since Boltzmann was attempting to explain how we could have departed from equilibrium enough to live in a universe in which entropy was low and obviously increasing, his thought seems clearly the intellectual origin of the problem of growth of order. Boltzmann also appears to have inspired Layzer's Strong Cosmological Principle, which was first presented in 1963 at a Cornell conference on the Nature of Time. Layzer describes how the universe can depart from thermodynamic equilibrium. ...consider a mixture of radiation and nonrelativistic particles initially at a common temperature. As the universe expands both gases will cool, but the particle gas will cool faster than the photon gas, so that a temperature difference will be created. So far we have considered ideal gases. Let us now take into account the effects of interactions. These always tend to thermalize the distribution. Whether or not they succeed in doing so depends on whether the relaxation time of the gas is short compared to the expansion time H-1. If it is, an approximately thermal distribution with a temperature intermediate between the relativistic and nonrelativistic values will result; if it is not, the high-energy particles will maintain a higher effective temperature than the low-energy particles. Similarly, interactions between photons and gas-molecules tend to equalize the temperatures of the two gases. The extent to which thermalization actually occurs depends on whether the mean interval between emission and reabsorption of a photon is small compared with the expansion time H-1. Layzer introduces the terms "specific entropy" and "relative entropy," then relates the latter idea to information. ...an initially thermal distribution will not in general remain thermal during the expansion. Let σmax denote the maximum value attainable by σ for given fixed values of the chemical composition, internal energy density, and mass density. Statistical mechanics defines thermal distributions by the property σ = σmax. Hence the relative entropy σ* = σ/σmax ≤ 1. The preceding discussion shows that the relative entropy of an initially thermal distribution will in general decrease in the course of the expansion. Since entropy is non-negative, 0 ≤ i ≤σmax. Zero information is associated with a thermal distribution, maximum information with a distribution of zero entropy. The preceding discussion shows that in general both the specific information and the specific entropy of an initially thermal distribution increase in the course of the expansion. The simple examples that we have considered in this section show that the cosmic expansion can generate information. But information is a precise measure — though not perhaps the only possible one — of the complexity of a physical system. Thus the notion that the complexity of the present day universe has evolved from initial simplicity, though paradoxical, is logically tenable. ...why should we suppose the initial state rather than, say, the final state to be simple? In the preceding discussion we can replace the word "expansion" by "contraction" wherever it occurs without impairing the logical structure of the argument. Thus we could equally well have argued that information is generated in a contracting universe if the initial distribution is thermal. The point raised here is fundamental to an understanding of the arrow of time. We know that at the microscopic level — the level at which fundamental particles and fields are involved there is complete (or very nearly complete) symmetry between the two directions of time. The time-symmetry of microscopic processes reflects the symmetry of (a) the laws governing these processes and (b) the auxiliary conditions. In particular, the distinction between "initial" and "final" states has a purely formal significance at the microscopic level. What is the situation in cosmology? Here too the governing laws are completely symmetric, but the distinction between initial and final states has more than formai significance if we assume that the initial (or final) state is one of thermodynamic equilibrium. If we are to avoid ad hoc assumptions we cannot simply assume that thermodynamic equilibrium prevails at some arbitrary value of the cosmic density. On the contrary, thermodynamic equilibrium is a physically reasonable assumption only when the rates of the microscopic processes that tend to establish equilibrium greatly exceed the cosmic expansion rate. Now, the rate of any binary collision process is proportional to a particle density and hence varies like S-3. The expansion rate is proportional to t-1 and hence varies like S-3/2 in a matter-dominated universe and like S-2 in a radiation-dominated universe. At sufficiently high densities equilibrium can always be established through binary collision processes (as distinct from spontaneous decay processes). We see, therefore, that in the limit S → 0, and only in this limit, a state of local thermodynamic equilibrium can be expected to prevail in either a matter-dominated or a radiation-dominated Friedmann universe. These physical considerations show that the temporal direction in which information increases must coincide with the direction of initially diminishing cosmic density, i.e., the direction in which the universe initially expands. In 1971, Layzer privately circulated an unpublished manuscript entitled The Arrow of Time, in which he clearly described his theory of the growth of order. Because the law of temperature decrease is not the same in a universe filled with radiation as in one filled with gas, the behavior of the third universe, in which both gas and radiation are present, is more complicated than that of the other two. If we mix gas at one temperature with radiation at a different temperature in a non-expanding container, the mixture will relax to a state of thermodynamic equilibrium at some intermediate temperature. During this process, which I shall call thermalization, the energy of the mixture stays constant, but its entropy increases. (Thermalization is closely related to the process of molecular diffusion considered earlier.) The rate at which thermalization occurs depends on the composition, density, and temperature of the gas and on the temperature and density of the radiation. Suppose that the thermalization rate is much smaller than the cosmic expansion rate in the third universe. Then the temperature of the gas will decrease nearly in accordance with the law appropriate to a gas-filled universe, while the temperature of the radiation will decrease nearly in accordance with the law appropriate to a radiation-filled universe. Hence a temperature difference will develop between the two constituents. This implies that information has been generated by the expansion. The information associated with a given element of the mixture is just the difference between the actual entropy of that element and the entropy it would have if the expansion were halted and the mixture of gas and radiation were allowed to come to thermodynamic equilibrium. The rate of generation of information is thus exactly equal to the rate at which entropy would need to be generated to maintain the mixture in a state of thermodynamic equilibrium despite the expansion. In the opposite case, when the thermalization greatly exceeds the expansion rate, entropy is actually generated at this maximum rate, and no information is generated. Layzer explains the counterintuitive simultaneous growth of order (information) and entropy. In the intermediate case, when the rates of thermalization and expansion are comparable, both entropy and information are generated. This example shows that entropy generation on a cosmic scale does not imply a destruction of information; information and entropy can be generated simultaneously. The reason is that the sum of information and entropy is not constant, as in more familiar contexts, but changes as the universe expands. The example also illustrates another important point, that the rate at which information can be generated depends on the relative rates of entropy-generation and cosmic expansion. Layzer's next public discussion of the growth of order was in his presentation at a conference in Cardiff, Scotland. His paper was entitled "Cosmic Evolution and Thermodynamic Irreversibility." In it he defined the "historical arrow of time," to be contrasted with thermodynamic, electromagnetic, and cosmological arrows. consider a mixture of non-relativistic gas and radiation. Suppose that at some initial instant the mixture is in thermodynamic equilibrium at the temperature T0. Suppose further that there is negligible interaction between the gas and the radiation. Then, as the universe expands away from the initial state, a temperature difference will develop between the two components. The cosmic expansion preserves the mean entropy per particle of each constituent, so that the specific entropy of the mixture does not change. But the maximum specific entropy increases monotonically in both directions of time. For if the thermalization rate were suddenly to become much greater than the expansion rate, the gas and the radiation would assume a common temperature, and in the process the specific entropy would increase. Hence at any given instant the actual specific entropy is less than its maximum possible value. In the general case, when the thermalization rate is neither vanishingly small nor infinitely large compared with the expansion rate, the specific entropy of the mixture will increase, but not as rapidly as maximum specific entropy. Since information is defined as the difference between the actual entropy and the maximum entropy (subject to given macroscopic constraints), this example shows that expansion from an initial state of thermodynamic equilibrium generates both specific entropy and specific information. This conclusion obviously applies under much more general assumptions about the state and composition of the cosmic medium. The essential elements of the argument are (a) that the 'initial' state is one of maximum specific entropy (zero information), and (b) that the rate of cosmic expansion — which is of the order √(6πGρ), where ρ denotes the mean cosmic density — may be comparable to or greater than the rates of processes that tend to produce the state of local thermodynamic equilibrium. Because the cosmic expansion is not quasi-static, it generates departures from local thermodynamic equilibrium and hence generates information. At the same time, irreversible processes generate entropy. Perhaps his clearest, most concise, and most widely cited description was in an article entitled "The Arrow of Time" for Scientific American in 1975. Suppose that at some early moment local thermodynamic equilibrium prevailed in the universe. The entropy of any region would then be as large as possible for the prevailing values of the mean temperature and density. As the universe expanded from that hypothetical state the local values of the mean density and temperature would change, and so would the entropy of the region. For the entropy to remain at its maximum value (and thus for equilibrium to be maintained) the distribution of energies allotted to matter and to radiation must change, and so must the concentrations of the various kinds of particles. The physical processes that mediate these changes proceed at finite rates; if these "equilibration" rates are all much greater than the rate of cosmic expansion, approximate local thermodynamic equilibrium will be maintained; if they are not, the expansion will give rise to significant local departures from equilibrium. These departures represent macroscopic information; the quantity of macroscopic information generated by the expansion is the difference between the actual value of the entropy and the theoretical maximum entropy at the mean temperature and density. In this article, Layzer introduced his famous example of the perfume bottle being opened and the perfume dispersing into the room. He likened the time-reversed process to a movie played backwards. 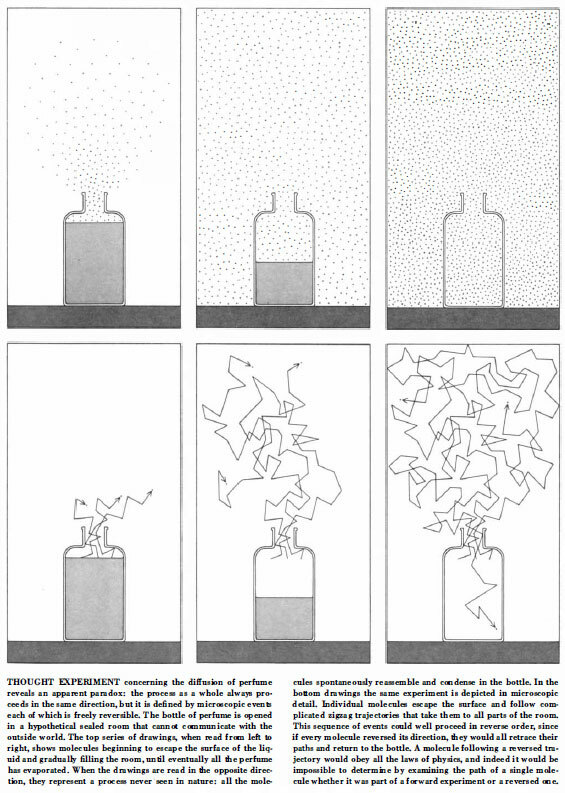 If the "initial" state contained "hidden" microscopic information corresponding to a reversal of the momentum of each perfume molecule at a certain time, classical dynamics says that the perfume will make its way back into the bottle. This is a powerful visual image illustrating Josef Loschmidt's reversibility objection to Boltzmann's H-Theorem. showed that no finite physical system can be considered closed. For example, consider the room in which we conducted our thought experiment on the diffusion of perfume. Even if the room has no door or windows, and even if the walls are insulated and made very thick, the system of molecules cannot be isolated from the rest of the universe. Perfume and air molecules must collide with the walls, which are also in contact with the outside world. More important, it is impossible in principle to shield the molecules from gravitational interactions with distant matter. The effects of such interactions are exceedingly small, but they are not trivial. Borel calculated that the change in gravitational potential caused by displacing one gram of matter by one centimeter at the distance of the star Sirius would, in the course of one microsecond, substantially alter the microscopic state of a macroscopic volume of gas. The unavoidable interaction of a nominally closed system with the rest of the universe operates as a small random perturbation that destroys correlations between the velocities of particles. The perturbation therefore dissipates microscopic information, and it perpetually re-creates the initial condition needed to ensure the decay of macroscopic information and the growth of thermodynamic entropy. But if the star Sirius were included in the dynamics, all paths would be determined? Because the system is no longer isolated, its dynamical history is no longer completely determined. In the real world, then, macroscopic information decays into microscopic information, but the microscopic information is dissipated by random perturbations. Expansion from the singularity is shown to generate macroscopic information as well as entropy; the widely held view that the Universe is running down rests upon a mistaken assumption concerning the relationship between information and entropy. And in part IV of the article, he described "The Origin of Macroscopic Information,"
It is widely believed that the second law of thermodynamics implies that the Universe was initially more highly ordered than it is now and that the order initially present is gradually being dissipated by irreversible processes. For example : "In the big bang' cosmology, the universe must start with a marked degree of thermodynamic disequilibrium and must eventually run down" (Hoyle and Narlikar 1967). I shall argue that, under certain conditions, the cosmic expansion generates information as well as entropy and that the second law does not require the initial state of the Universe to have been highly structured, or indeed to have had any structure at all. 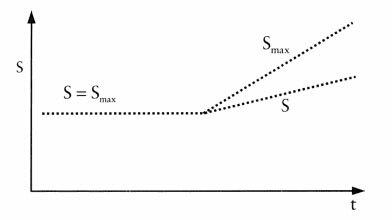 where Hmax denotes the maximum value of the entropy H subject to given constraints. The information present at any moment is thus equal to the entropy that would be generated if the mixture were to relax instantaneously to a state of thermodynamic equilibrium. Notice that the rates of entropy generation and information generation are not simply related. The rate of information generation assumes both its maximum and minimum values when the rate of entropy generation vanishes. This example suggests the general rule that information is generated whenever the expansion rate exceeds the rate of a local equilibrium-maintaining process. Nucleogenesis during the early stages of the cosmic expansion is the most familiar and the most thoroughly investigated example of this process. More generally, if the approach to equilibrium is mediated by two-particle interactions, then its rate is proportional to the mean density ρ. The rate at which the macroscopic parameters are changing is comparable in general to the expansion rate H(t), which is proportional to ρ during the early stages of the expansion. Thus the thermalization rate decreases faster with decreasing density than the expansion rate. 1. The cosmic expansion generates chemical information. I define chemical information as information that specifies deviations of the relative abundances of chemical elements from the equilibrium values appropriate to the prevailing temperature and density. As I discussed in the last section, the rates of chemical reactions are proportional to a higher power of the cosmic density than the rate of the cosmic expansion. The cosmic expansion causes the temperature and density of the cosmic medium, and hence the equilibrium values of the chemical concentrations, to change at certain calculable rates. When the density is sufficiently high, the rates of key equilibrium-maintaining reactions are fast enough to maintain equilibrium. Eventually, however, the rates of these reactions must fall below the cosmic expansion rate. The relative concentrations of the reactants are then frozen in. These considerations are perfectly general; they hold for weak and nuclear reactions as well as for ordinary chemical reactions. The chemical composition of the universe is, of course, very far from equilibrium. The chemical disequilibrium of the sun is the source of the free energy on which terrestrial life depends. 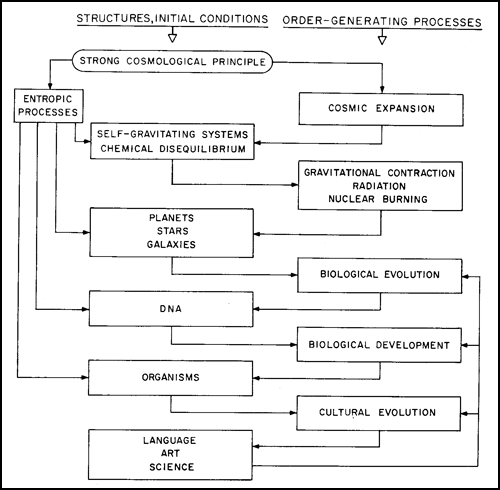 This illustrates how one kind of order-generating process (the cosmic expansion, leading to chemical disequilibrium) can give rise to initial conditions in which a qualitatively different order-generating process (biological evolution) can occur. 2. The cosmic expansion generates "morphological" information (the information needed to specify the nonuniformity of the mass density). The truth of this assertion is obvious under the assumption that the cosmic mass density was uniform in the limit t → 0. This assumption characterizes cosmological theories that postulate a cold initial state. [Layzer's "cold universe" theory] Cosmologies that postulate a hot initial state must also postulate initial nonuniformities. But these presumably contain less information than the cosmic mass distribution that evolves from them. 3. The evolution of an isolated system composed of a large number of gravitating particles generates information. In such a system the central density and temperature increase steadily, while the peripheral regions expand and become less dense. Thus a system of this kind evolves away from the maximum-entropy state appropriate to its energy, mass, and radius. A spherical system of gravitating particles confined by a reflecting spherical wall will evolve toward a stable equilibrium configuration if the ratio of the central density to the surface density in this configuration is less than a certain critical value. If the ratio exceeds this value, the equilibrium configuration is unstable and the core will continue to collapse indefinitely. Figure 1 illustrates the hierarchical relations among order-generating processes and the structures and initial conditions they generate. Each order-generating process creates a new class of initial conditions and structures, which provide the setting for a new class of order-generating processes. The figure is not complete. For example. it omits the subhierarchy of dissipative structures. In 1984, the Scientific American Library published Layzer's book Constructing the Universe, but it does not include a discussion of the growth of order. In 1988, MIT Press published the papers from a 1985 conference at California State University as the book Entropy, Evolution, and Information. Layzer contributed the paper "Growth of Order in the Universe." Expansion or contraction from an initial state of thermodynamic equilibrium generates both specific entropy and specific information. This conclusion obviously applies under much more general assumptions about the state and composition of the cosmic medium. The essential elements of the argument are (a) that the 'initial' state is one of maximum specific entropy (zero information), and (b) that the rate of cosmic expansion or contraction ... may be comparable to or greater than the rates of processes that tend to produce the state of local thermodynamic equilibrium. Because the cosmic expansion or contraction is not quasi-static, it generates departures from local thermodynamic equilibrium and hence generates information. At the same time, irreversible processes generate entropy. Consider, for example, a uniform mixture of blackbody radiation and gas in an expanding universe. So long as the radiation and the gas exchange energy sufficiently rapidly, they remain at the same temperature, which decreases as the universe expands. Eventually, the rate of energy exchange becomes too small to keep the gas and the radiation at the same temperature. (In an initially hot universe filled with hydrogen, this happens when the hydrogen recombines, at a temperature of a few thousand degrees Kelvin. Neutral hydrogen interacts very weakly with blackbody radiation at this temperature.) Thereafter, the gas cools faster than the radiation. If there is no interaction at all between the two components, the specific entropy of each one remains constant. But because the gas and the radiation are at different temperatures, their combined entropy is smaller than it could be, given their combined energy density. In other words, the potential entropy of the cosmic medium exceeds the actual entropy, and the difference increases as the universe expands. Thus the cosmic expansion generates information. The relation between macrophysics and cosmology is also problematic. The central law of macroscopic physics — the second law of thermodynamics — was understood by its inventors, and is still understood by most scientists, to imply that the Universe is running down — that order is degenerating into chaos. How can we reconcile such a tendency with the fact that the world is full of order - that it is a kosmos in both senses of the word? Some scientists say, "The contradiction is only apparent. The Second Law assures us that the Universe is running down, so it must have begun with a vast supply of order that is gradually being dissipated." But this way of trying to resolve the difficulty takes us from the frying pan into the fire, because, as we will see, modern cosmology strongly suggests that the early Universe contained far less order than the present-day Universe. Layzer's explanation of the growth of order is buried in his chapter criticizing the standard cosmological model of a hot "big bang," as preparation for discussion of his own "cold universe" model, which unfortunately has found little acceptance among astrophysicists and cosmologists. On pages 143-144, Layzer describes the growth of what he calls "chemical order," a departure of particle populations from equilibrium, which he distinguishes from "structural order," the gravitationally produced galaxies, stars and planets. In equilibrium, the "forward" and "backward" reactions go on at the same rate, so the ratio between the number densities of protons and neutrons doesn't change. Suppose that at some moment this ratio has the value appropriate to equilibrium at the prevailing temperature and density of the cosmic medium. As the Universe continues to expand, its density and temperature diminish, and the value of the proton–neutron ratio appropriate to equilibrium changes. Its actual value also changes, because the rates of the forward and backward reactions are no longer equal, and it changes in the direction that tends to restore equilibrium (the condition of maximum randomness). But whether equilibrium is actually restored depends on whether the reactions occur fast enough to keep up with the changing conditions. If they do not, a gap opens up between the maximum randomness (corresponding to chemical equilibrium) and the actual randomness; chemical order is generated. The average rate at which a proton collides with electrons is proportional to the number of electrons per unit volume, which, in turn, is proportional to the mass density of the cosmic medium. Similarly, the average rate at which a neutron collides with neutrinos is proportional to the mass density. It follows from Einstein's theory of gravitation, though, that the cosmic medium expands at a rate proportional to the square root of the mass density. Thus the rates of the reactions that seek to maintain equilibrium are more sensitive to changes in the mass density than the rate of the cosmic expansion, which tends to destroy equilibrium. Reaction rates depend on temperature as well as density. In general, they increase with increasing temperature. Because the temperature of the cosmic medium decreases as the Universe expands, the two effects of the cosmic expansion — decreasing temperature and decreasing density — reinforce each other. It follows that the rates of equilibrium-maintaining reactions must have exceeded the rate of cosmic expansion early in the cosmic expansion. Eventually, however, the rate of any given equilibrium-maintaining reaction must become smaller than the rate of cosmic expansion, as illustrated in Figure 8.6. 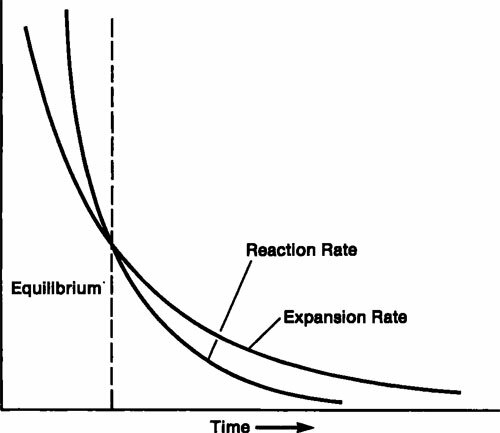 The curve representing the reaction rate is steeper than the curve representing the expansion rate. The two curves cross at a certain epoch. Before that epoch, the forward and backward reactions occur fast enough to keep the proton–neutron ratio close to its equilibrium value at the prevailing temperature and density; after that epoch, the same reactions no longer play a significant role in the chemical economy. FIGURE 8.6 As we look back into the past, we see the rates of equilibrium-maintaining reactions increasing faster than the rate of cosmic expansion. For any given reaction, there is a critical epoch (dashed line). At earlier times, the reaction is fast enough to maintain equilibrium ratios of the particles that figure in the reaction; at later times, it isn't. Chemical order is created when the rate of an equilibrium-maintaining reaction falls below the rate of cosmic expansion. A similar argument applies to every reaction involving two or more particles. Any such reaction maintains equilibrium concentrations of the particles that are created or destroyed by the reaction until its rate becomes comparable with that of the cosmic expansion, and then ceases to be effective. It follows that chemical equilibrium prevailed during the initial stages of the cosmic expansion, and only then. Chemical order was not present at the outset; it was created by the cosmic expansion. These considerations show, incidentally, that the onset of the cosmic expansion was not a "big bang" but an exceedingly gentle — although also exceedingly rapid — decompression. A bang, or explosion, creates large and sudden deviations from chemical, thermal, and pressure equilibrium; the cosmic medium began to expand in a state of chemical, thermal, and pressure equilibrium, and gradually deviated from chemical equilibrium as the expansion slowed down. Chemical order resides in deviations from chemical equilibrium. This dry and technical definition may give the impression that chemical order has little to do with the kinds of natural order we see around us — the order of a living planet, with its seas and rivers, its mountains and plains, its myriad forms of life. But this is a false impression. Earth is a living planet precisely because chemical order was created 10 billion or so years ago, when the Universe was very young. Without sunlight, there could have been no life and none of the changes that life has wrought in the natural landscape. Sunlight is a by-product of the burning of hydrogen in the core of the Sun. And hydrogen is present in such abundance in the present-day Universe because the nuclear reactions that, in the early Universe, would have converted hydrogen to helium and heavier elements could not keep pace with the cosmic expansion. We need not assume, as Clausius and Boltzmann did in the nineteenth century and as many modern astronomers and physicists still do, that the Universe started out with a huge store of order that it has been gradually dissipating ever since. But, strangely, there is no detailed description of the growth of order - as the difference between the actual entropy and the maximum possible entropy - that Layzer has developed so well in his several earlier works (and some subsequent ones). If we observe a thermodynamic system over a finite length of time, we can decide which is the initial condition and which is the final condition of the system. This allows us to find a time arrow according to thermodynamics. What is it that makes the system go only one way from the initial to the final state although the laws of physics themselves are invariant under time reversal? The point of view which we have is that the universe causes this anisotropy and acts as a sort of sink with which the system is constantly in interaction. This property is due mainly to the fact that the universe is expanding. Because the universe is expanding, as we know from Olbers' paradox, there is a predominance of matter over radiation; the density of radiation is very small. This condition is maintained by the steady-state cosmology, since as the universe expands, the high entropic energy in the form of radiation is continually lost because of the red shift, and new entropic energy in the form of matter is continually being created. This maintains the universe in a constant state of a sink. The tendency of the system to fill the sink is guaranteed by the presence of purely retarded interactions. In the "big-bang" cosmology, the universe must start with a marked degree of thermodynamic disequilibrium and must eventually run down, so it just happens that at present radiation is less important. References by others to Layzer's theory of the growth of order. Frautschi says he comes to a "a conclusion which stands the closed 19th-century model on its head. Far from approaching equilibrium, the expanding universe as viewed in a succession of causal regions falls further and further behind achieving equilibrium. This gives ample scope for interesting nonequilibrium structures to develop out of initial chaos (15), as has occurred in nature." The reference 15 is to Layzer's 1975 Scientific American article. Other than this note, there is no discussion of Layzer's work. Although brief, this is the essence of Layzer's idea. This is the only mention of Layzer in the book. He does not appear in the index. In his 1989 book The Emperor's New Mind, Roger Penrose speculated on the connection between information, entropy, and the arrow of time. We should note that Roger Penrose attended the 1963 conference at Cornell on the Nature of Time, at which Layzer presented his ideas on the Strong Cosmological Principle, but Layzer may not yet have formed his ideas on the growth of order in the universe. Rémy Lestienne wrote two books describing Layzer's - and Penrose's - ideas on the growth of order, The Children of Time in 1990 and The Creative Power of Chance in 1993. ...most physicists up until these past few years thought, as did Boltzmann, that in the past the entire universe (or at least the portion of the universe that is directly accessible to our measuring instruments) must have had a particularly low state of entropy and consequently a very high degree of organization. Only this hypothesis, it seemed, could furnish to the various systems that did and still do people this universe such an immense source of the growth of entropy. At first sight the hypothesis that the universe was initially in a state of low entropy seems difficult to reconcile with the wellknown scenario of the Big Bang. As Roger Penrose remarked: "The primordial fireball was in a state of thermal equilibrium — a hot gas in expansion, but in internal thermodynamic equilibrium. Let us remember, on the other hand, that the term 'thermal equilibrium' has to do with a maximum state of entropy." This contradicts the second law, which "requires that in its initial state, the entropy of our Universe must be a minimum and not a maximum state." The apparent paradox between the supposition that the universe in its entirety, through its expansion, has constituted and continues to furnish the ultimate source of temporality and the very reasonable hypothesis that the universe was, in the very first moments of its existence, in a hot and homogeneous state of very high entropy is not difficult to overcome. While it is true that the fireball began in thermal equilibrium, the universe at that moment was very small. The fireball represented the maximal state of entropy that could be allowed for a universe of that small size, but that entropy was still minuscule in comparison with that which is allowed for a universe the size of the current one. During the expansion, the maximum allowed entropy increased tremendously with the size of the universe, but the true entropy of that latter remained far below this theoretical limit. The second law of thermodynamics comes from the fact that true entropy is always less than the maximal allowed entropy and in some way lags behind it. This point of view is gaining the support of physicists of such diverse temperaments as Roger Penrose and David Layzer, for example... two physicists with largely irreconcilable views of the history of the Big Bang. Both have recently published works of great merit on this subject. They agree on the idea of finding a cosmological source for the growth of entropy and on the role of chance in this context. The source of chance can be specified in both cases: quantum indeterminism. But whereas Layzer proposes searching for the deus ex machina in a universal solidarity responsible for the absence of microscopic information in the universe [his Strong Cosmological Principle], Penrose thinks that the responsible party resides in the still poorly elucidated properties of gravitation and in a sort of fundamental symmetry between the uncertainty of the world in which we live and the existence of black holes, devourers of information. David Layzer and Eric Chaisson have provided slightly varying but compatible explanations of how the expansion of the universe allows ordered, or correlated, relational regimes to arise and persist, notwithstanding the second law of thermodynamics. Layzer spoke in terms of the rate of expansion outrunning the rate of equilibration involved at local scales, while Chaisson summarizes the argument as "In an expanding universe actual entropy … increases less than the maximum possible entropy," thus allowing for, or requiring, ordered (negentropic) relationships to arise and persist. But in his book, Cosmic Evolution (Harvard University Press, 2002), Chaisson says that "In an expanding universe, the actual entropy, S, increases less rapidly than the maximum possible entropy, Smax, once the symmetry of equilibrium was broken." And in person and in print Chaisson gives Layzer full credit for the theory of the growth of order, "The cosmologist David Layzer perhaps put it best," followed by a significant quote from the Scientific American article, "The Arrow of Time." Chaisson may have been first to provide a diagram that plots the actual entropy and the maximum possible entropy as a function of time, to show the Layzer theory for the growth of order graphically, with a bifurcation at the era of recombination.